"Very good low-carb dessert. Keto-friendly." Mix almond meal and butter together in a bowl; spoon into the bottoms of the paper liners and press into a flat crust. Beat cream cheese, eggs, sweetener, and vanilla extract together in a bowl with an electric mixer set to medium until smooth; spoon over the crust layer in the paper liners. 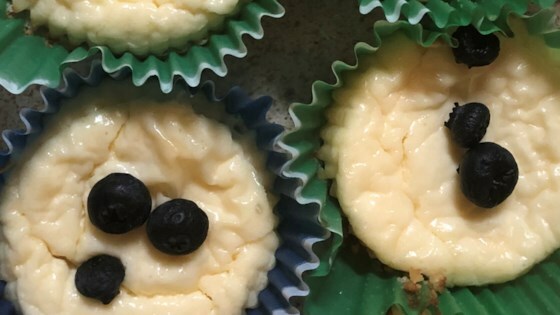 Bake in the preheated oven until the cream cheese mixture is nearly set in the middle, 15 to 17 minutes. These are really phenomenal. I used Swerve as the sweetener and I added maybe a 1/4 cup of sour cream and they really tasted like "real" cheesecake. Excellent! Thank you! I wish there were more keto recipes on this website. PS-for an extra special treat I add a teas of sugar free raspberry jelly on top. Amazing!!! Made it exactly and. It was excellent!! !